I won this little tractor on eBay and it needs to become the only John Deere Model D rail tractor I believe. I searched and couldn't find one as a prototype. The machine was built from '23 to '38 or so so it fits in my scenerio of 1937 nicely. I figure that the guys on the logging company found a good used tractor and bought it from a failing farmer. (depression years remember) One of the guys had been to England and had seen a GOGO tractor, but there were no Fordsons available. So, viola, a John Deere Rail tractor. This will be built in 45mm gauge, 1:24 scale. No, not narrow gauge, but still fun. My Gn15 stock will interact with the Logging Company's gear so I hope this is OK here. There will be at least one layout with 45mm and 16mm lines some day. Anyway, here's the pic of the tractor as I got it. I have now demolished it... no wheels or fenders. It will get a new chassis and running gear, more pics to follow. Oh, I need at least a zillion unfinished projects so I can work on something different all the time. I had originally intended this to be a power unit mounted on a chassis, but it may not be. Somewhere (haven't found them yet) I have 4 larger diameter drivers left from the railbus project. I think that they may work as direct drive. I'll have to narrow the final drive mounts, but that's no big deal. Sorry about posting this in the wrong forum. Thanks for moving it. I'll have to lower the front end a bit when I mount the axles permanently, but it looks good so far. The coupling rods (is that the proper term?) even seem to work. I had to remove the flat belt pulley off the right side, but the flywheel on the left clears the rod. Cool! It is going to be a unique little beastie, that's for sure. go for it. It looks great !!!!! Someone commented on the precarious position of the driver. And, in the interest of comfort and safety (who isn't interested in that?) they decided to get rid of the tractor seat and have a real footplate. 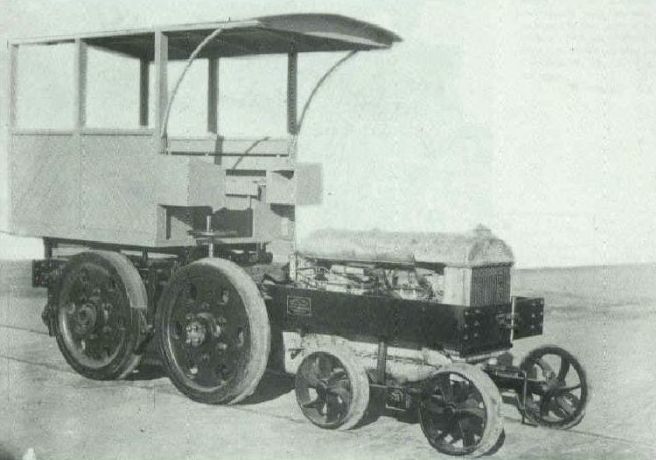 AND, inspired by this contraption, they designed a cab and built a prototype. Note the 'fenders' are part of the cab. Blimey Ken, they say there's a prototype for everything but that's pushing the weirdness envelope! Ian, that is true. That thing is nearly unbelievable. I can't imagine how they came up with it. I've decided to try and make this thing actually run under power. 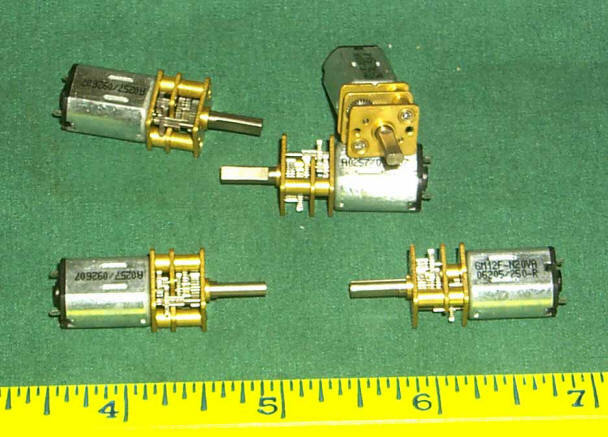 I have some of these little gear motors that turn at about 30 RPM. $4 each if you buy five from www.philsnarrowgauge.com. With a 1:1 bevel gear setup it should push the loco about 3 inches per second. I think that will be OK. I'll probably have to build a tool car to hide the batteries and tether the loco to the car for power.